Whether you are looking to explore the culture and history of Europe or trek across the beautiful plains of Africa, a visit to Busch Gardens Williamsburg or Busch Gardens Tampa Bay will provide just the environment you’re searching for. Complete with thrilling rides, highly entertaining shows, and a variety of imaginative sights and sounds, each Busch Gardens offers a distinctly different, yet equally entertaining, vacation experience for the entire family. For more information or to make your reservations by phone, please contact us at 1-800-987-9852. Carrying the Colonial theme of Williamsburg, Busch Gardens Williamsburg offers theme park excitement encased in a European atmosphere. From recreations of quaint European villages to exhibits featuring America's forefathers, Busch Gardens Williamsburg can certainly offer a burst of excitement while staying true to the experience of the area. 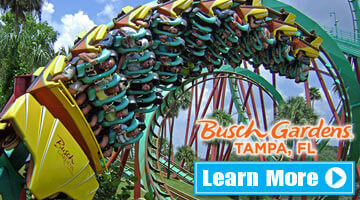 Those wishing to escape on an African safari need look no further than Florida and Busch Gardens Tampa Bay! Thrilling sights, sounds and experiences are all packed into this one of a kind theme park that carries the theme of Africa. 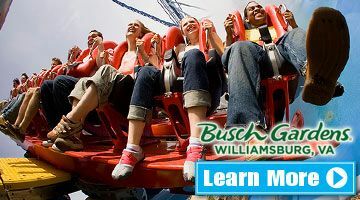 Just as with Busch Gardens Williamsburg, guests can expect to find numerous rides, live shows and other general attractions for a full day of family fun.